Ubisoft released some details on the various standard, deluxe and collector's editions of Ghost Recon Wildlands following the reveal of a new trailer that showcased a lot of the game's open-world gameplay. The game will not only have various special editions but also separate pre-order bonuses. According to Game Informer, there will be the Standard Edition for $59.99, it just comes with the base game for either the PC, PS4 or Xbox One. There's the Deluxe Edition for $69.99 – now according to the Ubisoft store, the Deluxe Edition comes with the base game plus exclusive weapons, gear and a few other premium items, including a Huntsman rifle, a Huntsman motorbike, three different emblems, three weapon camouflage kits, and three different character customization kits along with an XP booster. A step up from the Deluxe Edition is the Gold Edition, which is available for pre-order for $99.99. 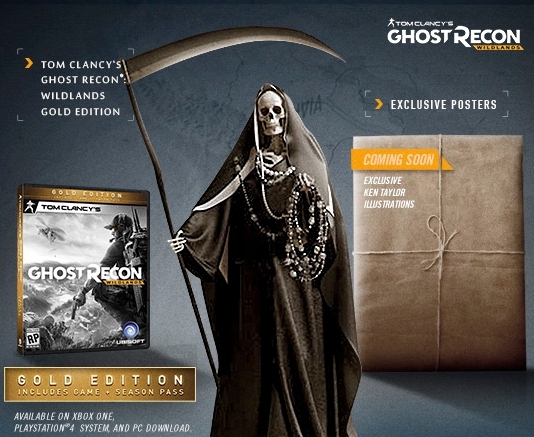 The Gold Edition comes with everything in the Deluxe Edition, but then adds in the season pass for Ghost Recon Wildlands. The season pass will grant gamers access to two full expansions for the upcoming Ghost Recon title, but they don't say what the time span will be between those expansions or how much each of those expansions will cost separately. Given that it contains everything from the Deluxe Edition, if you minus the Deluxe Edition price, it would mean the season pass will run you about $30. The last of them is the Collector's Edition. Now this special version of Ghost Recon Wildlands can be coupled with either the standard edition of the game, the Deluxe Edition or the Gold Edition. The Collector's Gold Edition will run you $159.99, which contains the season pass, all of the content from the Deluxe Edition, along with a 10.5 inch Santa Muerte figurine and a Ken Taylor limited edition poster set. That's a pretty hefty price to pay for all of that, and you don't even get a radio controlled car like with Call of Duty! However, if you aren't into all the special editions, limited editions or collector's editions, it's also possible to simply pre-order the basic standard edition of Ghost Recon Wildlands and receive a special bonus mission that will take you to the mountains of Bolivia. The mission will see you attempting to break up an alliance between two cartels, the Santa Blanca and the Peruvian Cartels. There's a lot of different versions of the game, and I do wonder how well people will be able to navigate them? In total, there are six different ways to purchase this newest Ghost Recon, and that's not including the pre-order bonus content. Ubisoft appears to be gearing up for a strong release of this open-world shooter and they have already committed to showcasing the game at this year's E3 during their press conference. According to the Ubisoft shop, Ghost Recon Wildlands will release sometime during the later half of 2016.